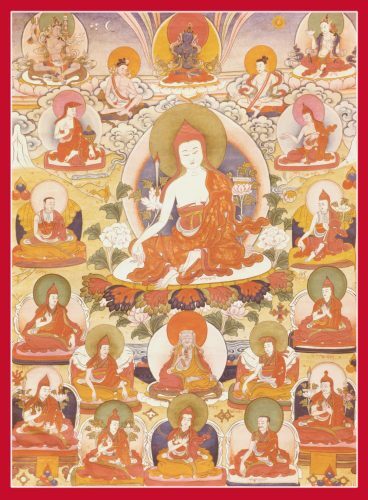 This thangka comes from the collection of the 3rd Jamgön Kongtrül, Lodrö Chökyi Sengé (1954-1992). It depicts Khyungpo Naljor, who originated the Shangpa lineage, with his main Indian masters : Niguma, Sukhasiddhi, Maitripa, Rahula, Dorjé Denpa and Abhaya. 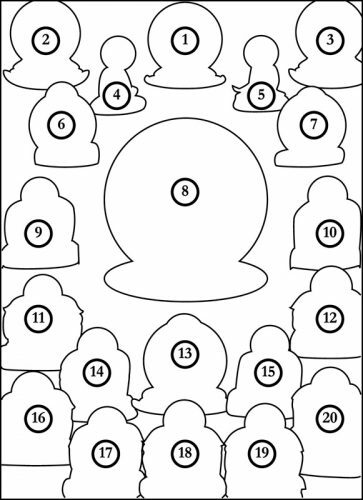 The « Seven Jewels » of the Shangpa lineage shown here are : Vajradhara, Niguma, Khyungpo Naljor, Mokchokpa Rinchen Tsöndrü, Kyergangpa, Nyentönpa and Sangyé Tönpa. Below are prominent masters of the transmission : Khyungpo Tsültrim Gön, Thangtong Gyelpo of the Thangluk branch, Jé Künga Drölchok and Taranatha of the Jonang lineage, Jamyang Khyentsé Wangpo, Jamgön Kongtrül Lodrö Thayé, Karsé Kongtrül (a trülku of Lodrö Thayé) and Kalu Rangjung Künchab.